The imagined isolation that Deleuze refers to in L’île déserte is lost – was it ever real? Exile on Elba or quarantine on Ratonneau are now likely impossible; the chances of finding an untouched, yet habitable, tropical idyll are slim. Yet the notion of the desert island remains lustily durable. Now that we are all connected, we crave isolation. While photojournalists report on seas that swallow desperate people, just as low-lying islands are submerged, our desert island illusion becomes, absurdly, ever more paradisiacal. For more than ten years Daniel Gustav Cramer has pursued a photographic practice that often consists of observation and collection; he gathers solitary objects and apparitions. For Cramer, this collection is a means to investigate objects or living things that exist in a self-contained state. His exhibitions bring together constellations of such objects, records of momentary coexistences. Cramer’s Iceberg (2016) is no island, or, rather, it is a temporary island. Or even more temporary than other islands. He saw it from a plane several years ago. 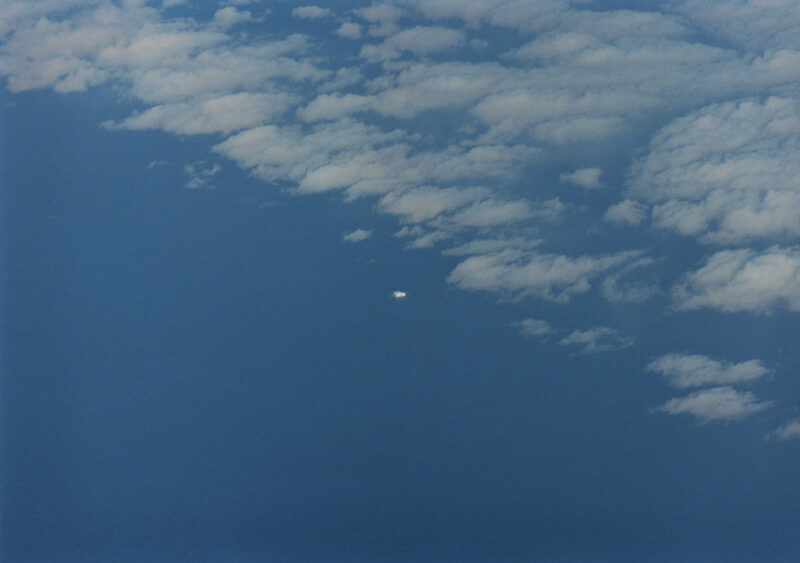 As the sun rises, tufty, fine clouds fill half of the image, dividing it roughly diagonally; the iceberg floats just below the diagonal, where the white cover gives way to endless, blank sea. The iceberg island is self-contained; it appears like a sculptural object made of frozen water which possesses inherent buoyancy and a stable structure. Yet it is in flux. Its sharp edges are illusory. Ice melts, and polar ice is melting faster today than ever in recorded history. In Cramer’s image water is manifest in three states: solid, liquid and gas. When something passes directly from a solid to a vapour state it is said to sublime or to sublimate. That process is taking place in this image; as sun falls on the side of the iceberg, its solidity is gradually absorbed into the air that surrounds it. Yet I cannot write the word sublime without thinking of the aesthetic sublime too, particularly how, for Immanuel Kant, writing in his Critique of Judgement, the sublime is an encounter between something immense and overwhelming in nature (he referred to mountains and thunderclouds) and our, ultimately superior, faculties of reason. The word sublime is derived – in both cases – from the Latin sublimis, in translation something like exalted, lofty, raised. Such as a person who, carried through the air, looks down and records the sublime scene of the vast expanse of water and its single iceberg far below him. Yet the scene is not entirely simple. There is a slight form at the peak of the ice. It may be an errant wisp of cloud; it could be a polar bear. It remains mysterious, no matter how much the negative is enlarged. Wondering about this is wonderful, it stirs the imagination to romantic, melancholic thoughts. Though if it is, if it was, a polar bear, the chances are that its situation finding itself marooned far from solid ground or a larger stretch of ice was gravely tragic. This unknowability of the evidence in front of us chimes too with another strand of Cramer’s practice. The artist repeatedly observes the human desire to understand and to document our environment and the inevitability of failure as we try to grasp a universe in ceaseless motion. So while his image accords with an idea of the sublime as something awe-inspiring, it casts doubt on Kant’s premise of the supremacy of human reason. When thinking about islands, Cramer’s Iceberg heightens the idea of what an island might be; the tiny image paradoxically magnifies this fiction and brings it into focus. The artist’s perspective, his disinterested observation, clarifies our ignorance. We know so much about the sea, about ice and about islands and do our best not to see it. So the desert island remains a durable illusion, perhaps exemplified in an image of an island that no longer exists. Daniel Gustav Cramer (Neuss, 1975) is an artist working in Berlin. 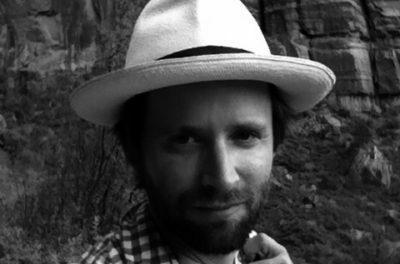 Daniel received his MFA at the Royal College of Art, London (2003). His work was exhibited in solo shows in Kunsthaus Glarus (2012), La Kunsthalle Mulhouse (2013), CAC Vilnius (2016), SALTS (2014), Kunstverein Nürnberg (2015), Kunstsaele Berlin (2014) and others. He has taken part among others in dOCUMENTA(13), Cuenca Biennale 2014, KIT Kunsthalle Düsseldorf, Madam Luxemburg, Cleveland Contemporary Art Centre, Renaissance Society Chicago, Artists Space NYC, Gebert Stiftung, Rapperswill – Jona, Neue Nationalgalerie Berlin, Nomas Foundation, Rome, Christophe Daviet-Thery, Paris. His ongoing projects include The Infinite Library, in collaboration with Haris Epaminonda. Aoife Rosenmeyer (Belfast, 1978) is a Zurich-based critic and translator. She studied fine art and cultural studies in the UK and worked as a curator in London. She writes for numerous media including Art Agenda, frieze, frieze d/e, Art Review, Art in America and Kunstbulletin and has contributed to publications on artists including Melanie Smith, Clare Goodwin, Michael Meier & Christoph Franz, Robert Kinmont, Daniel Karrer, Fritz Bornstück and Edit Oderbolz. In 2009 Rosenmeyer founded the irregular and itinerant debate series art+argument. She leads the Crritic! programme of events to focus on and improve writing about contemporary art in Switzerland in collaboration with Daniel Morgenthaler, and she has been invited to curate a series of artist talks at the Staatliche Akademie der Bildenden Künste, Karlsruhe for the academic year 2016-17.